I wrote a blog post on this yesterday, but thought you lot mught be interested (if you don't read my blog). 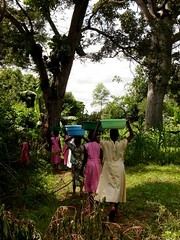 A friend sent me a little bag of green beans picked by herself and the pupils of a newly constructed school in Uganda. Pretty exclusive stuff, and quite a nice story, so i'm wondering how to roast it? Mod's Edit: URL(s) edited/embedded to fit page and prevent stretching. Hmm tricky one, if she's a geography teacher, might I suggest Lt. Vienna?